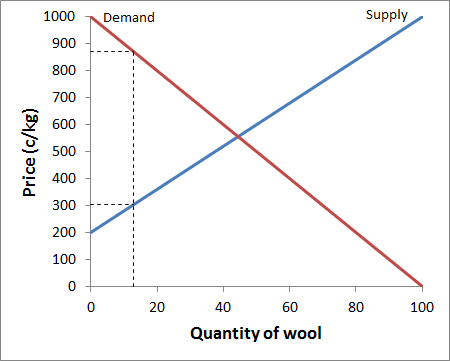 Pannell Discussions » 266 – Supply and demand: The wool crisis » Ideas in economics, environment, policy and more. The wool crisis of 1990-91 was a spectacular case of economic mismanagement, where an industry inflicted massive costs on itself (and others) through acts of obvious and determined stupidity. Industry leaders convinced Australian wool producers to endorse a strategy that was completely devoid of economic sense. The aim was to make producers rich, but the result was that they lost billions of dollars. What they did was establish a reserve price, below which they would not allow wool to be sold. That needn’t have been disastrous, except that they set the reserve price optimistically during a period of booming demand, and then refused to lower the price when demand cooled. Farmers kept receiving the artificially high price and so produced huge volumes of wool – much more than they would have done at the real market price. At the same time, wool buyers responded to the high price by reducing their purchases of wool and switching to other textiles. The predictable result was a huge stockpile of unsold wool. The industry borrowed billions of dollars to pay itself inflated prices for its own wool, put it in sheds and pay storage and interest costs, hoping that the price would rise again, but actually creating ever-increasing pressure for it to fall. It really was as ridiculous as that sounds. It’s hard to imagine how anybody involved could not see the folly in this, but somehow wool-industry leaders convinced themselves and most wool growers that it was a good strategy. Figures 1, 2 and 3 illustrate what was happening, in a simple supply and demand model. Figure 1 shows what the price and quantity would have been in a free market: a price of 555 c/kg, resulting in a balance between supply and demand, at 44 units. (These are not the real numbers – they are just for illustration). Figure 2 shows what happened when the Australian Wool Corporation (AWC) set a high reserve price (of 870 c/kg), and passed that price on to farmers. Because of the artificially high price, demand for wool was reduced (to 13 units in this illustration) while production of wool was increased (to 84 units). The wool that wasn’t bought (71 units – the difference between production and sales) was acquired by the AWC and stored indefinitely. Just as in Figure 2, the AWC found itself having to acquire most of the wool being offered to the market. By the end of the scheme, the amount of wool being stored reached extraordinary levels (4.8 million bales, approaching a billion kilograms), and it was incurring around $3 million per day (over $1 billion per year) in costs of storage and interest. The sensible way to get rid of over-production would have been to abandon the reserve-price scheme, but instead the AWC decided to tax the price received by wool producers. Presumably, the aim was to bring the amount of production down to about the volume of wool being purchased. Figure 3 illustrates this outcome. In this figure, wool buyers are still being charged 870c, so they are still only purchasing 13 units. Wool producers are being taxed 566c, so the price they receive is only 304c, resulting in production of 13 units (matching demand). If the original reserve price system was stupid, this system of taxing producers was stupid squared. For it to eliminate surplus production, wool producers would have had to receive a lower price, and produce less wool, than in a free market. And this was a system that was intended to benefit wool producers! Throughout the drawn-out crisis, proponents of the scheme argued that the shortfall in demand could be overcome through market promotion, and a big chunk of the wool tax was spent on this. A tenacious faith in this idea was partly what drove them to stick with the scheme long after it was clearly a disaster. If the experience proved anything, it’s that this faith was unjustified. Another factor driving them to stick doggedly with the scheme was an apparent unwillingness of the decision makers to admit that they had made mistakes. The delays in shutting it down greatly escalated the costs. Eventually (much later than it should have) the Australian Government exercised its power to force the AWC to lower the price and later shut down the scheme. The AWC fought it all the way. 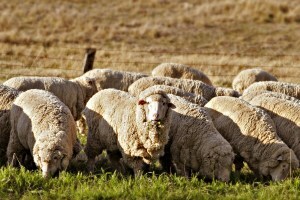 Wool producers, processors, traders and Australian taxpayers all lost money in this scheme. Charles Massy in his excellent book “Breaking the Sheep’s Back” estimates that the total cost was at least $12 billion in 2011 terms (and probably much more), making it “the biggest corporate disaster in Australian history in terms of losses generated by a single corporate or statutory business entity” (Massy, 2011, p.382). At the time of the crisis, I was living out in the wheat-sheep belt of Western Australia, so I got to hear much of the debate at the grass-roots level. Some farmers could see that the industry was making a massive mistake, but most were following the lead set by industry leaders and blaming the scheme’s problems on everybody else: politicians, economists, wool customers. It would be hard to imagine a more incompetent and irresponsible set of decisions than those of the AWC board and management throughout this episode. As a result they caused untold human misery. We can count the billions of dollars lost, but we don’t have statistics for the depression, the suicides, the fractured families or the agony caused to farmers by having to shoot and bury thousands of worthless sheep. I don’t think those responsible for this misery have ever been adequately held to account. The wool industry has never recovered. It remains a shadow of its former self. A really basic understanding of economics would have avoided all of this. Not only did the industry leaders lack this understanding, but, as Massy reveals, they actively resisted and rejected advice from competent economists when they received it, including economists who worked for them. Posted on 5 May, 2014 by David Pannell. This entry was posted in Agriculture, Economics, Policy. Is today’s situation with rice in Thailand the same, if not worse? Hi Neil. Current Thai rice policy does have some key things in common with Australian wool policy in the 1980s-90s. The Thai government has set a price for farmers that is about double the market price. As a result, production has boomed. A big stockpile of unsold rice has built up. And yes, the costs look like they are roughly similar in magnitude, and perhaps even bigger. There are some differences too. In Thailand it was a government decision (for electoral advantage) rather than a decision of the industry. It is mainly the government that is bearing the cost (billions of dollars per year), rather than the farmers. It doesn’t pose a threat to the long-term prospects of the Thai rice industry. Thai rice is a much smaller percentage of world production, so the scheme is having a smaller impact on traders, processors and other producers around the world. Once they abandon the scheme (as they will have to sooner or later), they should be able to return to more-or-less where they would have been without the scheme, whereas for wool there had been irreversible substitution away to other fibres. The Thai situation is made worse by corrupt officials, and by people bringing in rice from neighbouring countries to sell at the inflated prices. The situation that you describe has been seen in Mali it 8 years ago. With the higher prices of the products especially rice in 2008 which caused strikes in diverse Sahel countries including Mali, the Government has subsidizing agricultural inputs such as seeds and fertilizers which contributed to boost rice production. At the same time, the Government has reduced the taxes of rice and traders enjoy to export thousands of tons coming competition with local rice. Malian consumers who have a low very purchasing power are turned to the imported rice who cost 2 times cheaper than local rice. Rice farmers could not repay inputs subsidized price credit have sell off their production and most especially small producers have quit the countryside for the city looking for other opportunities. David, I have to admit that I was only a kid when I was dragged along to a wool scheme rally at the height of the issue. But I still remember that the issue was very much irrational and emotive. A lot of farmers were all about getting paid to produce, it was someone else’s problem to sell the stuff. To some extent there is a lot of that in all the pooled ag commodities. You only have to look at the way people reacted to the wheat board changes. Many regard themselves only as growers and don’t care about the end market, demand or, surprisingly, the price. The last point caught me off guard, but it was front page of the FarmWeekly (the season after the peak in wheat prices), with a farmer standing in a crop in spring saying he needed $300/t to break even, that made me realise how unresponsive farmers are to change, especially in their produce markets. Thus, they loved the floor price, it made everything easy. The most significant damage to the wool industry was from the existence of the stockpile even after the scheme was abandoned. In effect it meant that there was an unlimited supply of wool overhanging the market, and of course the supply/ demand relationship is really a psychological one. It is a perception. That was one of the options on the table. A lot of analysis was done to identify the best strategy overall. From memory, I don’t think destroying it came out best. What happened to ask that wool? I can imagine so many businesses benefiting from that huge stockpile, and the blight of the AWC, and make millions by producing and selling innovative and probably not so cheap wool based products. There ought to have been done savvy business man or other getting rich during this crisis? In Farsi, we’d say “catch fish from murky waters”. Situation is even more worst in my country Pakistan. Now the potato harvesting season is going on here in Pakistan and Govt do not set any price for potato to benefit the formers and today’s price for potato in local market is US $ 10/100 kg. Thanks for offering this course on line, who said there is no free lunch. What would you say about the prices of cotton in Pakistan? Where India and china is giving subsidy to their farmers in cotton production (violating the WTO rules) and Pakistan dont give any subsidy. And poor farmers are suffering. I don’t know what Pakistan is doing with cotton prices. In general, my starting point is that any assistance provided to farmers should not be built into prices. If the government wants to give assistance, it should be by some other way, such as by a payment that isn’t built into prices. In some situations large companies (or governments) in the supply chain have market power and can reduce prices to farmers below a competitive level. There can be a role for government intervention in this case. I would be regulating the supply chain, rather than subsidising farmers. Thanks for the educative piece on the importance of Demand and Supply. In my country Nigeria, the impact of Nigerian government is not felt much by the farmers; hence farmers are on their own. On many occasions, there are gluts in the markets and farmers are losers because they will have to sell at ridiculous prices which will lead to loss. It is my prayer that government in Nigeria will have strong policy and financial assistance for farmers so that many people will develop interest in farming which is the mainstay of the economy. I don’t know about Nigerian agricultural policy, but it is true that historically many developing countries have had policies in place that favoured urban dwellers and penalised farmers. This is really not a good idea, especially given the large numbers of farmers. You said that government assistance to farmers should not be built into prices. As you are aware that agricultural crop cultivation is not a profitable activity in developing countries. Given that do you advocate producer subsidies are as good policy tools to assist farmers in developing countries? I know that Sri Lankan government use the fertiliser subsidy to assist farmers. Building assistance into input prices is usually not quite as bad as building it into output prices, but it is still not a good idea. Subsidising inputs leads to over-use of those inputs, and can create problems such as water pollution or simply waste. If assistance is to be provided, it should preferably be provided as a direct payment to farmers that doesn’t affect input costs or output prices. An exception could be where an input creates external benefits. I think the best assistance is educational subsidies for farmers’ children (and even farmers themselves) so they don’t keep making these mistakes and supporting policies which are against their interest. In India still fertilizer subsidy is not streamlined. But government has started giving direct subsidy /cost to the LPG consumers. Instead of giving subsidized LPG the subsidy amount is directly credited into consumers bank account. Putting a subsidy straight into a bank account sounds better than building it into the price. It avoids distorting demand for the product or input. This is certainly an eye opener into economy of the Wool Industry for me. I never knew this and am pretty sure there are other industries facing this dire situation with leaders who only wants to make money. I regret to say that the same manipulation is being done by the Pakistan Government for the production of wheat. Firstly they declared that the production is going to be less and market price will be high in this year.Mostly people changed their cropping pattern and focus on the major wheat crop as well. But in vain farmers have to survive at he last. Govt has declined the prices upto 40 %. Like your article on 1990s Wool crisis remember it well – been in mkts 25yrs & as per current Chinese Stockmkt crash no one seems to learn about damage done from trying to fix prices – certainly makes it interesting – I call it the “gold fish theory” mkt can’t remember what happened 24hrs ago let alone 20yrs. What will be if Producers and Sellers will know how make supply curve, demand curve and to find our Market equilibrium price and Market quantity. A great article, knowing this, agroindustry in many countries would act more logically in markets; the problem with taxes and protectionism causes more costs in markets, then countries need to set up different ways to stablish trade barriers for imports and protect local farmers. In my view, one of the key lessons from experiences like this is that you should not be looking for alternative price mechanisms to keep any farmers in any particular product. The risks in trying to do so are too large. A better strategy would probably be to invest in research and development to create production systems that are more efficient or more productive. I support David Pannell because strategy is the key in any organization which provides proper directions and success and therefore would also reckon that better strategy would also be to invest in research and development. This will enhance and create productive systems which are efficient and more productive. The same situation except that there was no reserve price for silk in southern states(provinces) in India . The price for silk cocoons was very high during 2011 this promoted the farmers to take up Sericulture in non conventional areas, but now due to increase in supply the Government has taken measures like reducing the import duty of silk. So now since import duty is less textile industries started buying silk from Chinese, this made the the producer get less price hence growers uprooted the plants and this policy made a balance in demand and supply. This is just one side of coin. But the real problem is majority farmers here own land only for subsistence living so what to do with such consequences? The price management of staple crops in Nigeria is yet to to standardised, however, the improved value chain management of some few staple products e.g rice and cassava has helped stabilize the prices. Presently the Rice anchour project in Nigeria is producing more rice for sale (a good business synergy between the small and medium contract farmers , Big Rice Millers and corporate Organisations). Prices are still high yet stable. I believe in no distance future in Nigeria, the market equilibrium for most staple food will be at relatively lower price. This course has really enlightened me in the economic and social consequencies of government and other board policies which may be overlooked at the time of planning and implementation. Thank you very much. In Ghana, it is only cocoa that the government through a board regulates the prices. For some time now, there hasn’t be any challenge probably because about 75 percent of raw cocoa beans is exported. I am also informed that the selling price of cocoa by the board is hedged on the international market. Coordination along the cocoa value chain cannot also be underestimated. I think they have achieved a lot. I was a teenager being raised on a sheep farm and lived through this crisis. This article certainly brought back memories. Shooting sheep and throwing them in a pit is an awful memory that has never left me. I recall in our area that all the blame was with the Japanese. What was the rationale behind this? Yes, I never witnessed it, but I certainly talked to farmers who were deeply affected by having to shoot their sheep. There were wool processors in Japan. Blaming them was completely nuts. The problem was entirely created by the Australian industry. I am following the discussion. I really love this discussion! So, If suppose the reserve price of the wool was dynamic and was a factor of the then market supply and demand ratio, But still securing the livelihoods of the farmers, in terms that they manage to earn the part what they invested while taking care of the sheep and the processing charges etc. Would it have been the correct implementation of the scheme ? In this case, it was farmers themselves who effectively agreed not to sell their wool unless the price was above a threshold price. This is a really stupid strategy for a whole industry to adopt. It led to all the problems described in my article. In some countries, minimum prices are guaranteed by governments. The system used in Thailand to increase the price of rice is a good example. This is also stupid, and has wasted billions of dollars. It inevitably fails at some point. If the purpose of the policy is to help farmers, the best approach is to help farmers as directly as possible. Give them money as a direct payment, independent of how much they produce, rather than building it into prices. That results in a much more targeted and effective approach. If you build assistance into prices, the farmers who get the most assistance are the ones who need it least. “Give them money as a direct payment, independent of how much they produce” completely agree with first but would like to understand second line where you mentioned ‘independent of how much they produce’. for e.g if we have to pass-on direct benefit to 4 farmers A,B,C & D who are cultivating wheat on 2,3,4 & 5 hectare of land respectively, what should be the criteria to benefit them with direct payment? It depends on what the objective of the program is. If the aim is to help the most-needy farmers, you might set up a scheme that gives more to farmers with less wealth. Or if the aim is to help all farmers equally, you could give the same payment to every farmer. Or if the aim is to help all small businesses (including small farmers) you could give the same payment to all businesses with a turnover less than a certain amount. All of these options have risks attached, though. People would make efforts to restructure or re-organise their affairs so that they qualified for the payments. e.g. split a farm in two so that you have two smaller farms (e.g. owned by husband and wife), so that you qualified for two lots of payments. This effort would be a waste of time in terms of producing more food or wealth. It is very difficult to anticipate and think through all the perverse incentives that this sort of scheme creates. One thing that’s clear is that the dumbest thing you can do is build the assistance into output prices, which mainly helps the people who least need the help. In your discussion you mentioned how seasonality can affect the supply/demand nexus. What about quality as another factor? If the quality does not achieve benchmarks, then presumably it throws the market equilibrium price out of kilter? It doesn’t throw the market equilibrium price out of kilter. There are different prices for different quality wools. There is some degree of substitution between the different quality wools, but also sort-of different markets for them. I am Johnson and it is really for joining this course. I really thank you for knowing the importance of demand and supply . I also want to know how to impact the gorvement policy on market price. In Myanmar, most farmers get less benefit than the traders. I think the traders can defy the rice market in Myanmar. But, they still are succeeful nowaday.